The Japanese special peace envoy Mr.Yasushi Akashi Sunday morning arrived at Killinochchi grounds by a special helicopter of the Sri Lanka Air Force (SLAF) accompanied by HE.Mr. 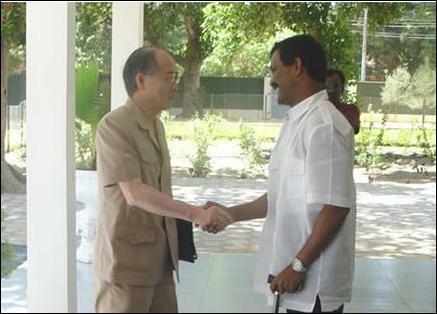 Soiiehiro Otsuka, Japanese ambassador in Colombo, and met the Head of the Political Wing of the Liberation Tigers of Tamil Eelam (LTTE) S.P. 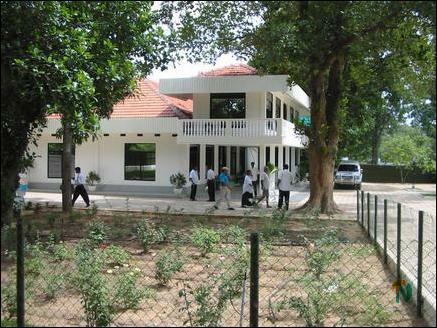 Thamilselvan at the LTTE's Peace Secretariat building, Vanni sources said. The discussion centered on reviewing the ground situation, ways to resume stalled peace talks and the concerns expressed by Muslims in east, Vanni sources said. Akashi pointed out that the donor-community was disappointed by LTTE's non-participation in the Tokyo and the followup conferences in Colombo. Thamilselvan responded with the reasons for LTTE' decisions regarding the matter. Thamilselvan explained to the envoy the lack of progress in bringing normalcy to day-to-day lives of the economically deprived sections of the Tamil people. Thamilselvan added that LTTE will relently pursue all avenues possible to ensure that funds allocated to Northeast development are utilized in the most effective and efficient manner possible and that funds cannot be subjected to bureacratic hurdles and the corrupt Sri Lanka Government's administrative machinery. Thamilselvan added that the proposals for the Interim Administration developed at the Paris conference with the help of expatriate Tamil experts and LTTE officials contain LTTE's suggestions on mechanisms to receive, disburse and monitor utilization of development funds. Japanese Ambassador H.E.Mr. Soiiehiro Otsuka, Director of the southwest Asia division Mr.Tako Yamada, Mr.Ryousuke Kamono from Japanese Ministry foreign affairs, Second Secretary Mr.K.Yagi and Second Secretary Mr.M.Yasuda accompanied Mr. Akashi to the discussions. "It was a very useful discussion with Mr.Tamilselvan. We spoke to him about the Tokyo conference on reconstruction and development of Sri Lanka which took place in June, also talked to him about the conference which took place just two days ago on 12th of September in Colombo which was approval meeting of the Tokyo conference in which the donor countries and the organization reaffirmed their commitment to assist to Sri Lanka at the whole at this difficult time. Also they wanted to encourage the parties in peace negotiation to make a speedy and very substantial progress and the assistance is linked to peace process and this question with link it will continue to be subject of a great interest to the International community. And we wanted to assist people in North East with regard to their urgent and humanitarian and rehabilitation needs and in that sense the question of the transition of administrative structure was discussed and Mr. Tamilselvan assured me that very soon they will be able to present their proposal to the Government and it is hopeful of the agreement with the Government on that particular question. I stressed that, we are here in agreement on the need for the people to enjoy the so-called dividend of the peace as soon as possible. And we discussed a number of other matters, which are over interest to donor community in the world, and I was able to get clarification on number of these points from Mr. Tamilselvan. So I am satisfied with the result of our discussion but we will continue our discussion over lunch with regard to some other matters. I am satisfied my talks with the Prime minister as well as other ministers like Pieris and Morahoda and Hakkeem and this evening I have another meeting with the Prime minister and tomorrow I will have a pleasure meeting with the president." Mr. Akashi during his tour to Amparai district Saturday met the Sinhalese delegation at the Amparai district secretariat. The Sinhala delegation comprised two representatives each from the United National Party (UNP) and Peoples Alliance (PA) and members of the clergy and civil leaders, sources said. The delegation told Mr. Akashi the aspirations of the Sinhalese living in the Amparai district. Later he met the Amparai district parliamentarian and a Minister in the UNF government Mr.P.Dayaratne, sources said. The Japanese peace envoy told Mr.Dayaratne that he was able to obtain first hand information from the rural people of Amparai on the ground situation, sources said.